Romania : When and where to go? The Romanian climate is continental with hot summers (temperatures reaching over 30°C) and harsh winters (almost -10°C in Bucharest). This is most evident in the mountainous areas than on the coast where temperatures are milder. Spring and autumn are short but very enjoyable. To visit the country, you would be best to choose May and June, or September, unless you prefer to explore the snowy landscape at Christmas time in Moldavia. If you want to enjoy the beaches of the Black Sea, July and August are obviously the best time. A beautiful country where you can let the senses take control, Romania has, in addition to the charming landscapes, very kind people. Bucharest, the capital, suffered under the reign of Ceausescu: However, it has some interesting monuments to see including the Old Court Church, the George Enescu Museum, the Orthodox Church of the Strada Stavropoleos and the Cotroceni Palace. Due to its huge size, do not miss Parliament Palace and its three thousand rooms. In Transylvania, visit the city of Brasov: A beautiful medieval city, it has a superb Gothic church. From here you can discover the famous "Dracula's Castle" (Bran Castle) defended by the spectacular Rasnov fortress, then the peaceful city of Sighisoara with its many buildings full of history: The Clock Tower, the church of the Dominican monastery and the Hill Church are some great examples. Leisure lovers should not miss the Black Sea coast, and make a stopover at Constanta, Romania's main port, before going on to Mamaia, a beautiful golden beach. To admire the birds, if you are a nature lover, the Danube Delta offers lakes, dunes, pink swells and fishing villages that you can discover by boat. 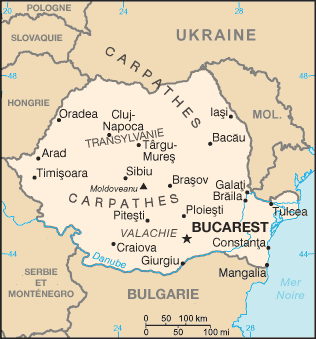 Romania is connected by air to many European capitals. No visa is required for EU citizens for a stay of less than three months. The currency in circulation is the new Romanian Leu. The budget required is quite low because Romania is still a cheap country. Average accommodation costs less than €50 and a very reasonable meal less than €15. There are no serious health issues in Romania, but the traditional vaccinations are recommended, as well as that against hepatitis A. In the mountains, boil water or purify it before drinking. Take a few precautions against stray dogs (even in Bucharest!) and protect yourself from ticks in the countryside as well as the mosquitoes. Regarding travel within the country, flights can be an affordable solution to go from the capital to major cities. Buses are also cheap but fairly inefficient. The train is probably the method of transport with the best quality/price ratio in Romania. Souvenirs: Tablecloths, woollen blankets, carved wooden spoons, painted eggs from Bukovina, icons on glass.